The Wynn hotel and casino already offers spectacular rooms. Now they have taken service to the next level! For example, instead of trying to figure out the controller to open the drapes just tell the room to open the drapes! 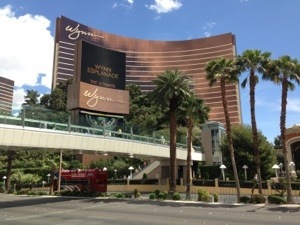 Amazon Echo Room Voice Control with Alexa smarts has been added to the Wynn hotel. This feature adds voice control to allow patrons to control their environment! Apparently this is the first time this type of voice control has been offered. As of the date of preparing this post, not all rooms have voice control. Subsequently the feature is being added to all rooms over the next few months. We cannot wait to try it live! There will be some kinks to work out, however knowing Steve Wynn’s reputation it will not take long to sort them out. This is one of the best hotels to stay at in Las Vegas. Even their regular rooms are well above the majority of rooms available across the city in other hotels. Yes they are expensive but they are worth it. Like all other casino properties, if you gamble and use a slot card, the room may be compensated. Always use a slot card when playing and check with your host to see what rates they will offer for these really fantastic rooms. We will add to this post once we have tried it ourselves. In the mean time readers can leave a comment about their own experiences.